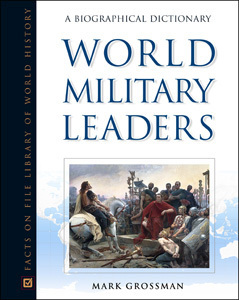 Encompassing commanders from the beginning of recorded history to the present, World Military Leaders: A Biographical Dictionary profiles the influential military leaders throughout history. Spanning the centuries from 3500 BCE to the present, this comprehensive A-to-Z dictionary presents the stories of the military leaders whose actions precipitated enormous change in the world around them. From master strategists such as Alexander the Great, Charlemagne, and Napoleon to the great tacticians, including Decatur, Hannibal, and Rommel, this complete reference will serve as an indispensable guide to the student and military buff alike. "The entries are clearly written..."
"...should be considered by college and public libraries with an interest in military biography..."
"...strongly recommended addition to school and community World History and Military History reference collections, as well as being a fascinating and informative browse for military and history buffs."